This is a second concert in ZVO.ČI.TI So.und.ing DUO 2018 series. The performance took place on February 6, 2017 at Kino Šiška, Komuna hall. Recorded programme (each part approx. 20 min); - Goto80: Ljubljama Lubljana is a live improvisation made on the 1980’s home computer Commodore 64. There are no preparations and all the instruments and arrangement are typed from scratch in an archaic computer interface, shown on a screen for the audience to follow every step. - Luka Prinčič a.k.a. Nova deViator – Goto80: General Purpose Users The piece is inspired by the idea (via Olia Lialina) that in order to critically understand contemporary technology we need to bring back the notion of a general user and protect the general purpose computer. We may look like hackers, but we are users like everyone else. - Luka Prinčič a.k.a. Nova deViator: Resonating Places Now leans on pondering about what can constitute a resonance, where it is situated and if time does have anything to do with it. In the piece various sonic materials are used, mostly digitally generated and processed. Formaly it draws on fusion of the various elements: glitches, syntesized sounds, micro-harmonies, pulses, beats, drones and textures. It is created specifically for “so.und.ing” project. 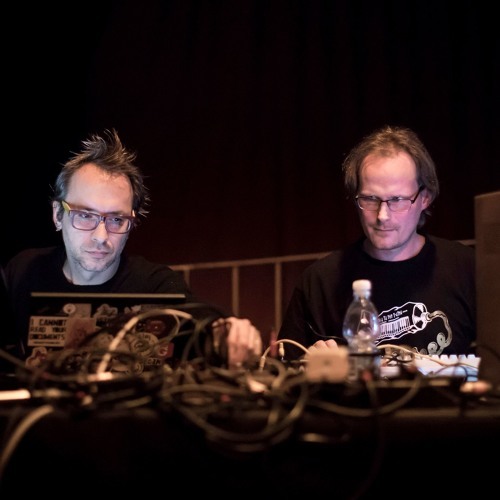 ZVO.ČI.TI so.und.ing DUO is a series of electroacoustic performative sound events premiering works created in collaboration between a Slovenian and an international artist. http://www.cona.si/zvo-ci-ti-so-und-ing-duo-cikel-2017/ Curator: Brane Zorman Photo: Ales Rosa Produced by: CONA Institute for Contemporary Arts Processing Partners: Kino Šiška CONA program supported by the Department for Culture at the Municipality of Ljubljana, The ZVO.ČI.TI so.und.ing DUO series supported by the Ministry of Culture of the Republic of Slovenia.